Visit Ticket Broker - Vivid Seats.Com for the BEST PRICES on . . Younger generations claim that seeing Doc "MistaBluesman" Quinn play his acoustic guitar is like hanging with your Grandpa on a back porch on a steamy, lazy Summer evening with your Grandpa playing his guitar while casually mesmerizing you with his rich playing and soulfully baritone vocals. MistaBluesman is living proof that in many aspects of life, age is indeed relative and music is timeless. Listen to the versatility living within the heart & soul of MistaBluesman as he performs two of his "Original Blues" recordings below! MistaBluesman performs his solo acoustic "Size Fifteen Shoes"
MistaBluesman performs his latest track "Funky Country Blues"
On July 23, 1949 MistaBluesman came into this world to play his Blues for music lovers all around the world. 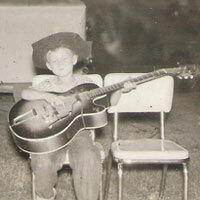 MistaBluesman's Prophetic Blues started it's life in 1955 when his Father handed MistaBluesman his first guitar. MistaBluesman's Father Buddy Quinn), Mother (Lois Quinn) and sisters are all credited in the teaching of basic guitar and love for the guitar to MistaBluesman. From that day to this very day MistaBluesman states that every lick on his guitars is sounded for the pleasure of music lovers/listeners worldwide. For those of you needing free downloads of MistaBluesman's Original Tracks please visit MistaBluesman's Reverbnation Music site. All MistaBluesman CD's are personalized, signed and created for you by MistaBluesman himself. Select tracks and purchase your CD below. CD cost for 15 tracks = $15.00 (plus shipping) Cash, Check or PayPal. Read about how my tracks came to be! Bluesman For Hire - Paris, TX and surrounding areas. my Lord calls for me I'm ready to take off running to him. If you desire a CD you better get it now! Or call me at 903 495 4483 to book me for a live gig. Thank You & Always Remember . . . . . .
Doc "MistaBluesman" Quinn Love's You All! If my Blues eased your sadness and heartache then as a true Bluesman, I have done my job! The electric guitar slide master Cliff Houck (Big Red Blues Dawg) and MistaBluesman meet and hammer one out live. The proof is in the puddin'. Watch and listen to MistaBluesman's "Back Home Blues" featuring "Cliff Houck" and his electric slide hot rod guitar - Click Here! Please join up as friends with "Cliff Houck" on Facebook, MySpace and everywhere else you can. You're gonna' love this cat! Special Note: Please be advised that ALL my domain pages are under construction and on their way to being matched to my home page design.